I am at the finish coat stage and after 2 coats of finish with Interlux paint I am getting lines or ridges. I used their primer and before that I had 5 coats of epoxy over fiberglass. I had that finish like glass - took awhile but was perfectly smooth. I maintained that after primer. Now I have these ridges. Ist coat I did rolling with a foam roller and tipping with a good brush. 2nd time I used a foam brush be the results are the same. Here are some shots that hopefully will show what I am talking about. Can't seem to and the pictures. Could it be that it is hotter now in your shop then we you did the earlier work? You might try adding a flow agent to your paint such as Penetrol it helps the paint flow and extends the working time before it starts to dry. Great for applying in hot weather. No actually I building in my basement which is the same temp year round ~65. The best place ever to build a boat (I did the Tiny Titan and it just fit) so I have a major project on my hands after the Utility build project. Hopefully I will get some pictures up and it will make more sense. I'm thinking of building a Utlity in my basement as well. How wide a door opening is actually needed? I imagine building the boat only to discover it needs to be sawn in half to get it out. Well in terms of size - the critical measurement is beam width and max depth - not sure I know the technical term. Length is not a problem as long as it can fit through the opening's width and height you should be OK - I have to add some stairs. In sum: 5 feet wide and 3 feet deep and 12 feet long. It seems to get bigger the more you build. Not too mention you get more and more attached to it. It might just have to stay in my basement along with the Tiny Titan. I wish I knew why and can not post pictures. The Glen-L Boat Design page for the Utility says that the hull depth is 26". I've seen elsewhere 2' 6" or 30". Don't know which to believe. I also don't know how much variance to allow for. Here are some pictures of the finish after two coats. Before I started the primer coat was absolutely smooth - like glass. Vendor (Jamestown) said I should thin. Could humidity differences be a factor in finish quality? 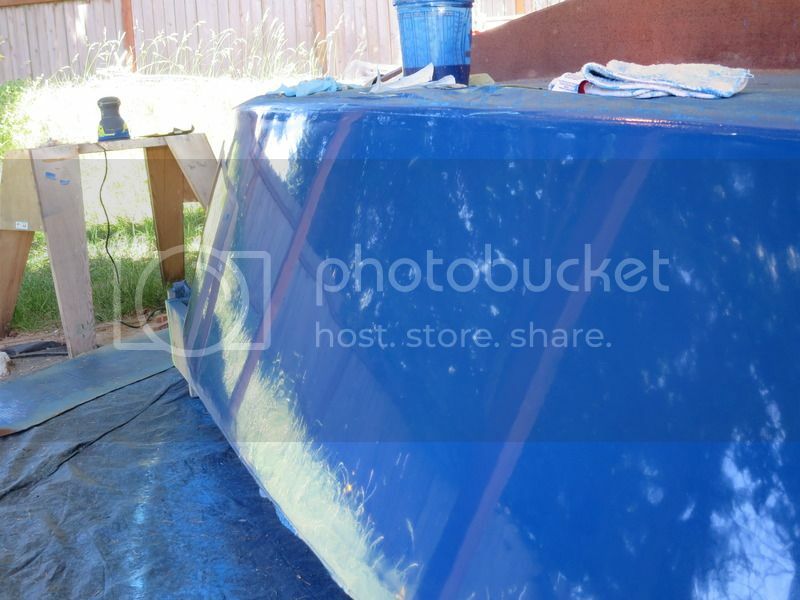 I'm building a Stevenson Super Skipjack and had similar issues with the topsides paint. Not ridges, but texture. I was using Interlux Pre-Kote primer and Interlux Brightsides paint. After a month of repeatedly sanding back unsatisfactory finishes and going through three times the paint I would otherwise have needed, I finally figured out how to get the smooth, shiny finish I wanted. 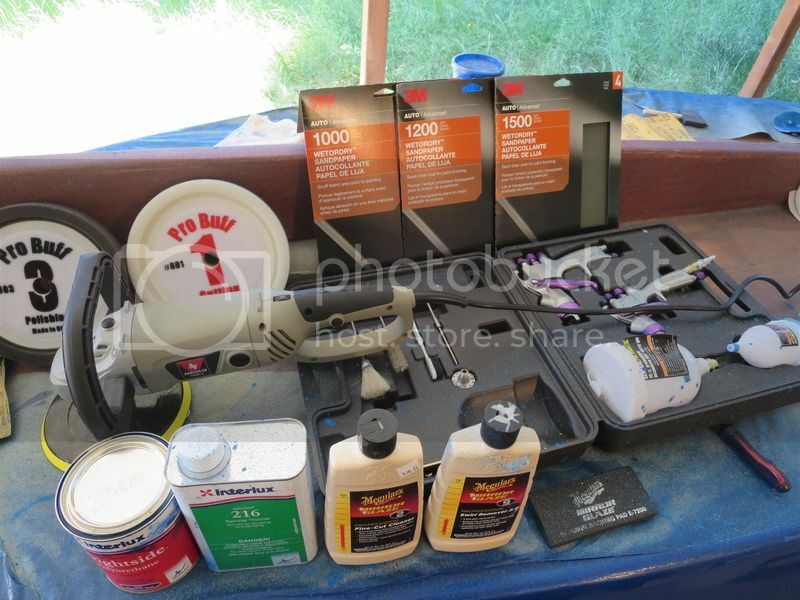 I bought an automotive HVLP sprayer kit from Harbor Freight, and a polisher, sandpaper, buffing pads, etc. from a local auto paints store. I drastically thinned the paint to a 1:1 ratio with Interlux 216 Special Thinner. This is almost as expensive as the paint itself. But it's xylene-based so I suspect cheaper hardware store xylene might work just as well. I sanded down the textured paint surface smooth with a RO sander using 220 grit pads. Then, using the detail sprayer (with the 1.0mm nozzle), sprayed two coats of thinned paint, waiting just long enough between coats for the thinner to evaporate just enough so that the paint wouldn't run. In retrospect I should have done at least three coats this way, because at the polishing stage I went through to the primer in a few small spots which I had to touch up later. About 24 hours after spraying, which resulted in a fine orange peel texture, I wet sanded by hand with back and forth crosshatch strokes, not circular strokes on the advice of the auto paint store manager, sequentially using 1000, 1200 and 1500 grit sandpapers. Just enough to remove the texture. Next, polishing. I used a #1 cutting pad and McGuire's cutting compound, followed by a #3 pad with McGuire's polishing compound. The end result of all this labor was a smooth and untextured mirror glaze finish. One disadvantage I had was that my compressor is too small. It's a 6-gallon "pancake" compressor. The auto paint store manager told me I should get a big 60-gallon compressor or even larger. I didn't do this but instead compensated by stopping spraying whenever the compressor kicked in and waited for it to catch up. Seemed to work okay. If I had a larger compressor I might have been able to use the larger sprayer and less thinner. Thanks for the info. I am really struggling with this painting phase. I have not tried the spraying yet, I really thing I should be able to roll and tip. Like you, I have sanded off more primer and paint than I put on. I am finally to the point where I have the hull painted and finished to almost perfection. I am ready to clear coat. My question is do I really want the perfect glass finish before clear coat using "Lust" varnish from Jamestown. I am about to buy a buffer and pads as you suggest but think I might wait til I have the varnish on. Your email and details were very helpful! Reading this thread makes me realize that perhaps my threshold of, 'That's looks awesome!" is too low. The only 'mirror-like' shine on my boat is the chrome hardware. Varnish over paint? I would think that a clear coat made for top coating paint would be more appropriate. I'd use the varnish on the bright work instead. But then I'm not a paint expert. If you polish your top coat make sure the coat underneath it is sanded smooth with a fine grit. Otherwise sanding and polishing the top coat might cut through it into the under coat. By the way, I didn't need a clear coat over paint to get the gloss I did. Just a marine topsides paint. The finish was created by the tools I used, not a clear coat. The sprayer wasn't too expensive, about 45 bucks. But all the items pictured did add up. Get a good polisher with plenty of power. The ones at home depot are wimpy. I got my polisher at the auto paints store (about 85 bucks) but you could probably pick one up with similar power at harbor freight for about half that. All the sandpaper, polishing compound and buffing pads I got at the auto paints store. I tried the roll and tip method also but didn't like the results, no matter what combination of paint & thinner, type of roller or brush I used. It wasn't pretty. That's why I ended up buying all this spray and polish equipment. Yeup - I found out the hard way. Varnish goes on the bright work not paint. Jamestown told me the bad news: Broke my heart, I was sooooo finished with the hull and wanted to flip. Now I am back to sanding down the whole hull again this time taking off 2 coats of varnish...At least the spray rails and trim strip are good to go. I already ordered a sander - went with Bosch - that is my tool MFG of choice - and will get pads and use your technique; after I get all the varnish off.